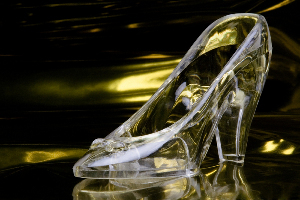 The idea of a glass slipper conjures up many ideas. Many of us have grown up having fairy tales read to us at bedtime, going to the cinema to see the Walt Disney interpretation of a fairy tale and indeed in more recent years sitting in our own living rooms watching the film on video. Most of these films are romantic 'happy ever after' stories. None more so than the unforgettable Cinderella. What young girl has not dreamt of going to that ball, wearing a beautiful gown, a pair of glass slippers and meeting her very own Prince Charming. However, has anyone ever given a thought to just how uncomfortable a slipper made from glass would be to wear? Glass is a hard inflexible material and with the natural movement of a foot when walking it would be likely to slip off with every step. Hardly comfortable for the wearer. Whilst impractical to manufacture slippers made from glass for human wear ornamental slippers are being produced and have become popular as gifts for special occasions, including anniversaries, birthdays, weddings and the birth of a new baby girl. They are likely to be inscribed with details of the occasion and make a lovely reminder of a special event. The Glass Slipper has become a popular name for bridal shops in many parts of the world. The romantic atmosphere from the fairy tale has crossed over into real life. After all most brides dream of being a fairy tale princess on their wedding day.